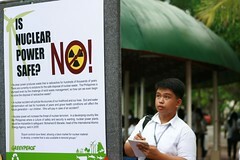 Last week, I joined Greenpeace on its Anti-Nukes Roadshow, a public awareness tour about the dangers of nuclear energy and to promote the Energy [r]evolution our campaign for renewable energy sources and energy efficiency practices, to the provinces that have passed resolutions that allow nuclear power plants to be constructed in their areas. Our first stop is Pangasinan Pangasinan as earlier this year its provincial board members have voted 7 to adopt a resolution on the construction of nuclear power plants from South Korea along the province’s coastline. The group set up their exhibit in the San Fabian church and Pangasinan State University in Lingayen to engage the public for almost a week. Most of the people that we talked to are not aware about the resolution, they are even shock that their board members will agree on this. Some of them are familiar about the dangerous effect of nuclear energy. When we asked them if they know about renewable energy they said yes and pointed out the Bangui wind farm in Ilocos as an example. At the end of our trip we gathered more than a thousand signatures, written in paper pin wheels, which we will deliver to President Noynoy Aquino calling his support in promoting renewable energy instead of nuclear. Its a good experience engaging the people and getting their support on something that the future generations will surely benefit. So what’s Greenpeace’s actual position any way? Does global warming cause increased or decreased rainfall? They say both. But it does not matter really as global warming or CO2 has nothing to do with monsoon intensity. But it finds a 1:1 correlation with ENSO – El Nino (La Nina) Southern Oscillation. However, if the IPCC painted scenario had only been true, an increase by 20% in rainfall could have given India a double digit growth rate for agriculture and at least double that in terms of GDP. Such stupendous growth could have wiped out the face of poverty within 5-10 years in our country. If this is “climate change”, Indians should be welcoming it with open arms. But alas, more than a decade passed after the IPCC had predicted such a scenario but we find practically no such change in our rainfall long period average (LPA). The LPA, even factoring the current “exceptional” summer rainfall, remains still a shade below 100%. This typical means justify end tactics not only eats into the credibility of not only Greenpeace but the entire NGO and environment. What public credibility has NGO/environment groups left with? If they tout they follow evidence based M&E then they should ensure their advocacy campaigns reflect this value as well.